It’s a really funny observation when it first strikes you. Peanut butter is not at all a common food item in France. When you go to the supermarket, you see lots and lots of jellies and jams of every conceivable flavor (including at least a dozen varieties of plums), an entire section of Nutella, more varieties of honey than you knew existed, and chocolate … shelves and shelves of really good chocolate. But you don’t see a lot of peanut butter. It’s still “exotic” here. Little French boys and girls never grew up on PB&J sandwiches the way we did. That’s why, I think, the French are absolutely enamored of this most American of foods. The proof: my luggage every time I travel back from the United States. That first request from Guillaume started a family tradition. Now every time I come back from America, I bring back several bags of peanut butter M&Ms for everyone, but I’ve also started to broaden their horizons. The latest additions to my cargo have been Reese’s white chocolate peanut butter cups (at the suggestion of a Twitter friend who follows my blog) and peanut butter Snickers (after Michel discovered them, thanks to my mom). It’s with a certain national pride that I always venture back from my native land laden down like a pack mule with peanut butter products. Despite the fact that “peanut paste” had its origins among the Aztecs of Mexico and was originally patented in 1884 by a Canadian from Montréal, peanut butter in its current, delectable form really is an American creation. At least that’s what we learn in elementary school! (Merci beaucoup, George Washington Carver!) Disputed as its history might be, I’ll continue to defend it as America’s finest culinary export … a claim the French seem ready and willing to embrace wholeheartedly. Incidentally, next Tuesday (January 24) is National Peanut Butter Day in the United States. American expats, don’t forget to celebrate it with your favorite French peanut butter fanatics! 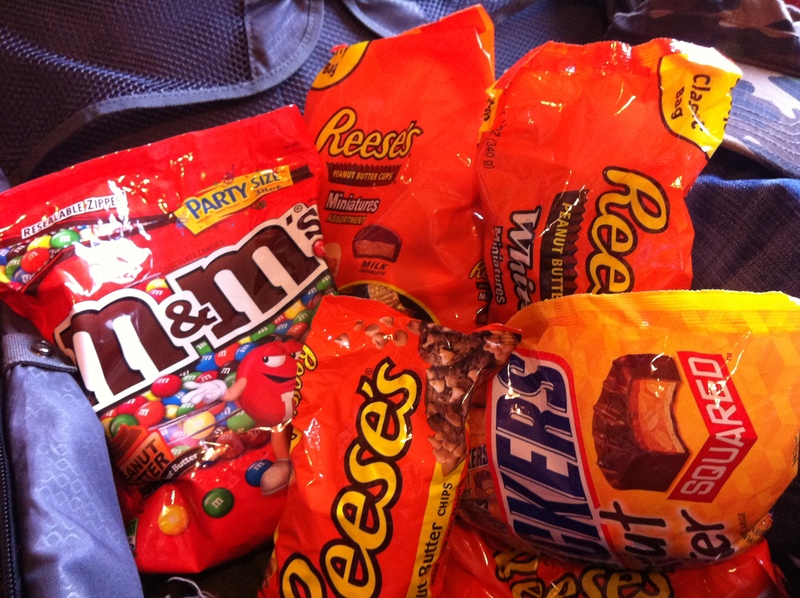 And if you’re in need of some peanut butter M&Ms for your festivities, let me know. I just might be able to help! YEAH for PEANUT BUTTER!!! Why didn’t I think of bringing it back?!? Well, there is that little American Store near Bosquet I think where I could buy it – for like – probably 50 bucks! For peanut butter lovers everywhere, here is a wonderful recipe from the lovely Orangette, for Salted Peanut Butter Cookies. The best bit? They contain chopped chocolate, too! Just follow the recipe carefully, and the hints from the blogpost, on the salt content. I can testify they are YUMMY.